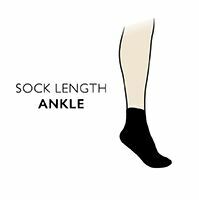 Featuring a double ‘sock-in-sock’ construction, the design of X-Socks Run Evolution Socks permits these serious runners socks to absorb friction at the outer layer, while letting moist warm air exit through both from the mesh hose next to the skin. This doubling up ensures that the foot remains dry and defended from abrasion, with all rubbing of surfaces done between the two layers rather than on the foot, so no blisters form. As the close fitting, finely knit mesh inner sock transports moisture outwards, 12 patented technologies in the outer sock draw in and circulate fresh, dry air, and provide added protection at critical points such as the ankle, Achilles tendon, instep, heel and toes, and in the anatomically shaped footbed, all assisting in absorbing impact stresses from footfall. X-Cross bands at the ankle improve stability and minimise the chances of injury. The fabric used for these X-Socks Run Evolution Socks mixes several of X-Socks’ developments for the wearer’s benefit, including protective hollow core Robur, breathable, anti-allergenic Mythlan and bacterial growth reducing SkinNODOR. All you need do, is keep on running.